Time to Give Up White Bread and Pasta. Really! The results of a new study are actually putting a new twist on replacing saturated fat in the diet. Yes, by all means replace it, but not with white flour products and sugar! OK, here are the nuts and bolts of this important study. The study was conducted because it was known that when carbohydrates replace saturated fats there is an association with a higher risk of ischemic heart disease. The researchers decided to investigate the risk of myocardial infarction (MI – heart attack) with a higher intake of calories from carbohydrates and a lower intake of energy from saturated fat. They also decided to look at carbohydrates with different glycemic index (GI) values (Generally, highly refined carbohydrates like sugar and white flour products have a high GI and whole grains and vegetables have a low GI. Marianne U. Jakobsen and others conducted the newly published study in The American Journal of Clinical Nutrition in June 2010. The study conducted at Aarhus University Hospital Aalborg, Denmark included 53,644 women and men free of any previous heart attacks at the beginning of the study. During the 12 years of following the subjects, there were 1943 cases of heart attacks (MI). The researchers say that their study validates the idea that saturated fat has an important role in heart attack risk, but (This ‘but’ is the new piece of information) – BUT the benefits of cutting back on saturated fats depend on the sort of carbohydrate prevalent in the diet. When complex carbohydrates like whole grains and vegetables with low GI are the prevalent carbohydrate replacing the saturated fat, the risk of MI decreases. And when the carbohydrates are high GI (think processed grains and sugar), the risk goes up. The subjects, who had the highest average dietary glycemic index, increased their heart attack risk by 33 percent for every five percent increase in calorie intake from carbohydrates. You wouldn’t want to stake your life with those odds. What a bummer! You make a big effort to cut down on the sat fats and where does it get you? Worse off than before, unless you also cut way back on white flour products and sugar. It seems that one good deed must be followed up with another. Fortunately, there are delicious whole grains, fruits, and vegetables just eager for you to eat them instead of the processed stuff, and there are yummy ways to prepare them. This blog and other sources have a wide selection of recipes and suggestions to do so. The researchers have suggested that the public should consume fewer refined foods, more non-starchy vegetables, fruit and legumes as a practical way to reduce heart disease risk. While this is especially important for diabetics who have an increased risk of MI, this should really be a ‘wake up call’ for everyone to stop waiting to eat more fruits, vegetables, legumes and whole grains and to stop eating processed flours, and sugar. In addition, they also mentioned that eating this way would tend to lead to consuming more fiber and micronutrients, which are factors also considered to play a role in the prevention of ischemic heart disease. The bottom line is that if you’re moving toward consuming a Mediterranean-style eating plan, such as described in this web site, you are definitely already moving in the direction to avoid the problems that these researchers have discovered. It’s time to reject processed grains and sugary foods, too much meat, cheese and junk food; begin discovering how deliciously vegetables and whole grains can be prepared – it’s worth your whole-hearted effort (to keep you and your family’s hearts whole). The picture below was taken at an event honoring my little 8 year old grand-daughter Brooke. Her mother put out this nice buffet on their kitchen counter. The reason I wanted to post it, was that it reminds me that so many people are now cognizant of making whole foods available for their families and their guests. We were very appreciative of the beautiful fruits, vegetables and whole grain salads. 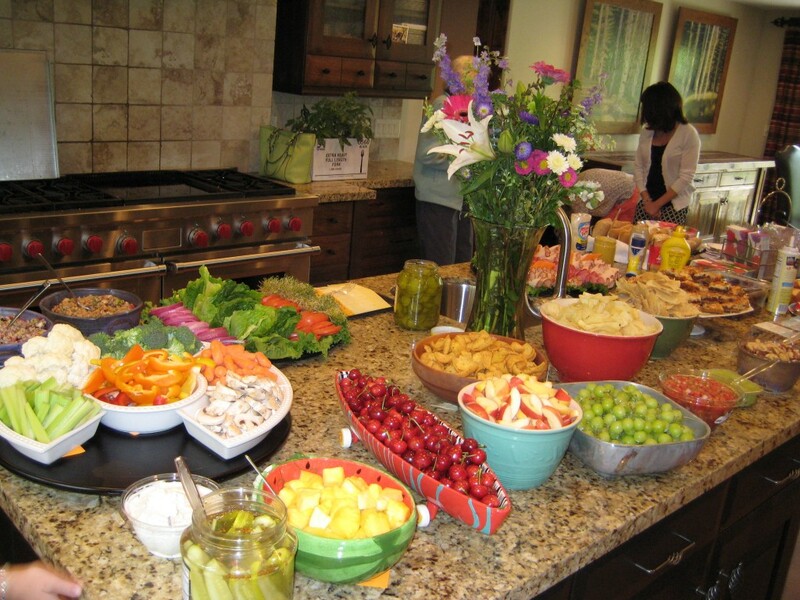 Heather's inviting, colorful, healthy, and yummy buffet luncheon. 0 responses to Time to Give Up White Bread and Pasta. Really!